(Nanowerk News) The mechanics and dynamics of heat-assisted magnetic recording (HAMR) are now better understood thanks to work by A*STAR and the National University of Singapore ("A study on dynamic heat assisted magnetization reversal mechanisms under insufficient reversal field conditions"). The experimental study will help scientists aiming to break the areal density barrier of current magnetic hard disk technology. A scanning electron micrograph of an array of 50-nm-diameter magnetic islands used to simulate a heat-assisted magnetic recording (HAMR) data storage medium. Today’s hard disk drives record and store data in minute magnetic domains on a spinning magnetic platter. As the magnetic domains become smaller, the thermal noise rises rapidly, making it increasingly difficult to record data reliably. HAMR is a promising future data storage scheme that uses a more stable magnetic medium, in combination with local heating, to achieve more reliable magnetization switching. “HAMR can be implemented with magnetic grains as small as 3 nanometers and higher magnetic anisotropy, which will make it possible to store magnetic information at recording densities beyond a terabyte per square inch,” says research leader Yunjie Chen from A*STAR’s Data Storage Institute. Theoretical simulations have demonstrated the potential of HAMR but also the possibility of density-limiting electrical noise and problematic non-reversal of magnetic domains in the recording process. Chen’s team designed some experiments to probe the dynamics of HAMR. “For practical application of HAMR, it is important to understand the thermo-magnetic reversal process and recording performance, including magnetization dynamics and effects that limit areal density,” says Chen. The experimental HAMR recording system devised by Chen’s team consisted of an array of magnetic islands of multilayer cobalt and palladium. 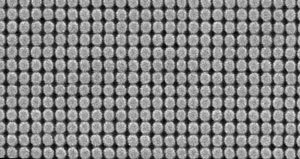 Preparing this device involved sputtering multiple atomic layers of different combinations of elements, then patterning the device using electron-beam lithography to produce magnetic islands of about 50 nanometers in size (see image). The team then used far-field laser heating with a thermal spot size of about 1.5 micrometers in combination with a magnetic field to simulate the magnetization switching of the HAMR process. They observed the resultant magnetization patterns using a high-resolution magnetic force microscope. Chen’s team showed that when the material was laser heated to near its Curie temperature — the temperature at which the material’s permanent magnetism is overcome by an external magnetic field — the strength of the magnetic field required to induce complete magnetic switching was about 13 per cent of the intrinsic magnetic ‘coercivity’ of the islands. Surprisingly, however, the team also discovered that, due to thermal fluctuations, the optimal temperature for recording is slightly lower than the Curie temperature. Chen explains that the results provide critical operational parameters for the practical implementation of HAMR data storage technology.